Sir Weston opened his eyes. His muscles felt weak and the breath was gone from his chest. There was nothing to be seen anywhere, the darkness was overwhelming. A fun guide about Neopian soups. 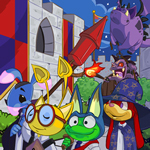 I recently returned to Neopets from an almost 6 year long hiatus. It was a particularly hot and sunny day on Mystery Island to start the year's Gadgadsbogen festival. The heat was so unbearable, even Taelia the Snow Faerie had removed her winter jacket.